If you are looking for comfort and style, look no further. 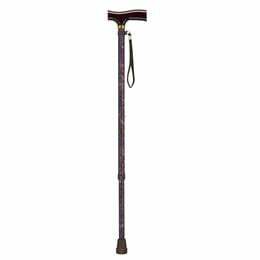 Drive Medical's adjustable height "T" handle cane has you covered. The hand grip is designed to reduce stress and hand fatigue providing a more comfortable experience. The handle height adjusts without tools from 31" to 40" allowing for personal sizing and comfort. As an added bonus, a handy wrist strap attached to the handgrip will ensure that you are always in reach of your cane when you need it. Available in a great designer color this cane provides style and quality all in one. The product is manufactured with sturdy, 1" diameter anodized, extruded aluminum tubing which can withstand a weight capacity of 300 lbs. Handle ranges from 31" to 40"
Handle to Floor (Height): 31"-40".